When talking about implementing change in the church, I always believe that one of the easiest ways to do so is taking advantage when an opportunity arises. My church was in the need of purchasing more pew bibles. Our current pew bibles were the New International Version (NIV), but I was interested in changing them to the Common English Bible (CEB). Since this new translation came out, I have appreciated how the translation has given me a fresh perspective or new insight on familiar scriptures and stories that I have been reading for years. For the past month, I have been reading scripture in worship from the CEB and having worshippers follow along in the NIV pew bible, giving them a chance to notice differences and reflect on how the differences resonate with them. Kids in 2nd to 5th grade have also been using the CEB during their Sunday lessons and have even written some prayers for worship, inspired from the CEB translation. After a month of familiarizing ourselves with this new translation and the approval of our session (leaders of the church), we purchased the new pew CEB bibles. When replacing the bibles, we wanted the dedication of the new bibles to be interactive, intergenerational, and meaningful. 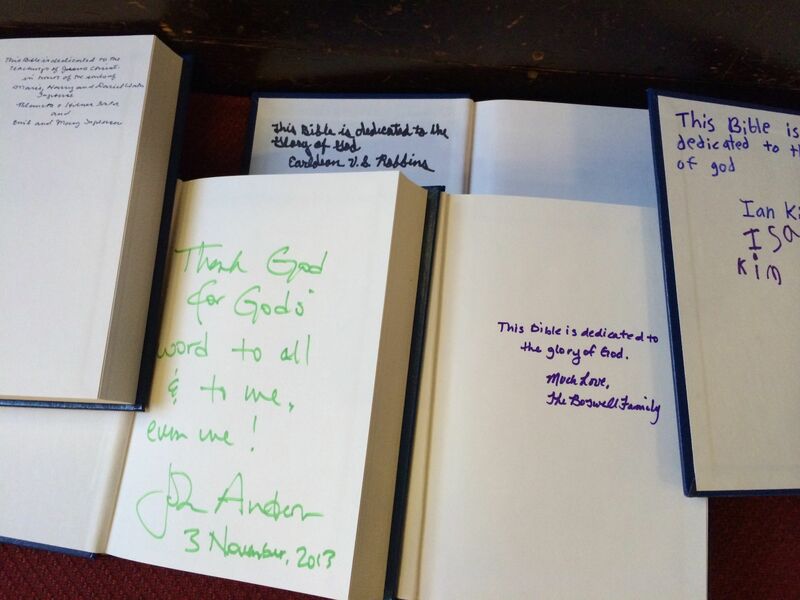 People seemed to appreciate the concrete activity of dedicating these bibles. There is something about the act of actually writing one’s name or loved one’s name in the bible that makes this act meaningful. Bibles are meant to be marked up, weathered, and used. By writing in the bible, they are intentionally being broken in. It’s like getting that first ding on a new car. As one smells the new pages of the bible and hears the first crack of the binding, we are writing in the pages of these bibles, inviting others to interact with these stories as well. The kids loved being able to mark their presence in the church. Watching families writing their own names in the bible and discussing in the pews what they will write was wonderful to observe. Dedicating bibles was an opportunity to pass out bibles and invite others to pass on bibles to their friends. We also handed out children’s bibles to those who didn’t have one. 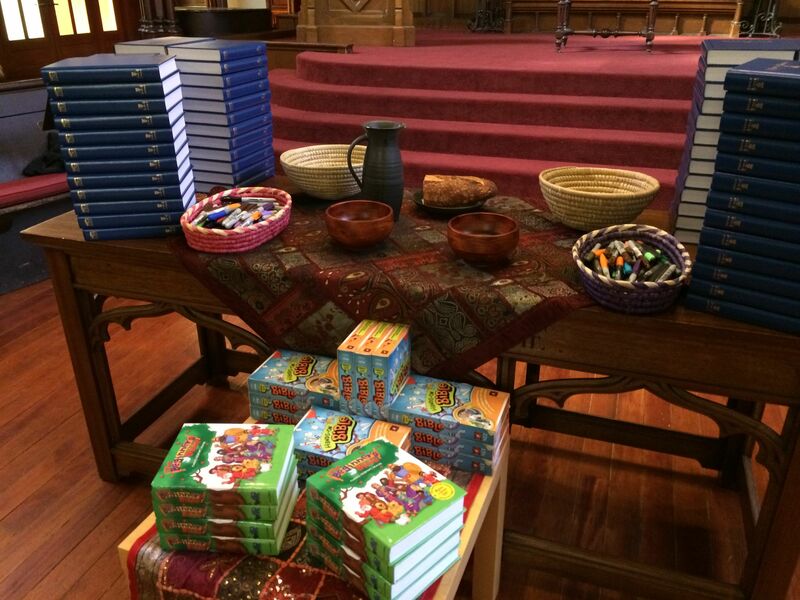 We invited people to take home the old pew bibles to keep for themselves or pass on to a friend. For those who don’t regularly read the bible, they found the practice of comparing translations as a great invitation to engage in reading the bible. We will most likely allow people to dedicate the bibles over a couple Sundays, knowing that not everyone comes every Sunday and wanting to involve as many people as possible.